“Fans of Love”, the Ad Council Love Cam commercial launched on Valentine’s Day 2017, has been nominated for Most Outstanding Commercial in the Emmy Awards. 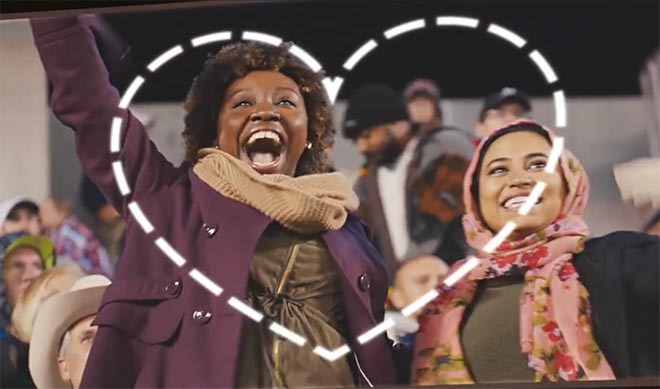 The Fans of Love commercial, part of the Love Has No Labels advertising campaign, began as a live stunt at the 2017 NFL Pro Bowl in Orlando in January, taking the kiss cam game feature, the jumbotron, to a new level. The unbiased camera centred on a range of people, celebrating many forms of love – friendships, families and romantic relationships – across race, religion, gender, sexuality, ability and age. The Fans of Love campaign directs audiences to lovehasnolabels.com/faces-of-love, which features a quiz to help people examine their own biases and resources on how to take actionable steps to rethink those biases. An interactive “Fans of Love” video presents relevant campaign facts and links to educational content to audiences as they are watching the film. The campaign taps into the expertise of six leading non-profit organisations including, Anti-Defamation League, Southern Poverty Law Center, Human Rights Campaign, American Association of People with Disabilities, AARP and Perception Institute. To show their support for creating a more accepting and inclusive community visitors can use the “Faces of Love” tool by adding the iconic Love Has No Labels frame to their photos and purchasing Love Has No Labels merchandise in the campaign shop. Most Americans agree that people should be treated respectfully and fairly. Yet many people in the United States still report feeling discriminated against. One of the main reasons is because we’re actually discriminating unintentionally. We do 98% of our thinking in our subconscious mind, and that’s where we collect and store implicit biases. Implicit bias influences how people are treated and how they interact with each other. It can also perpetuate disparities by altering someone’s ability to find a job, secure a loan, rent an apartment or get a fair trial. To end bias, we need to become aware of it first, especially in ourselves. 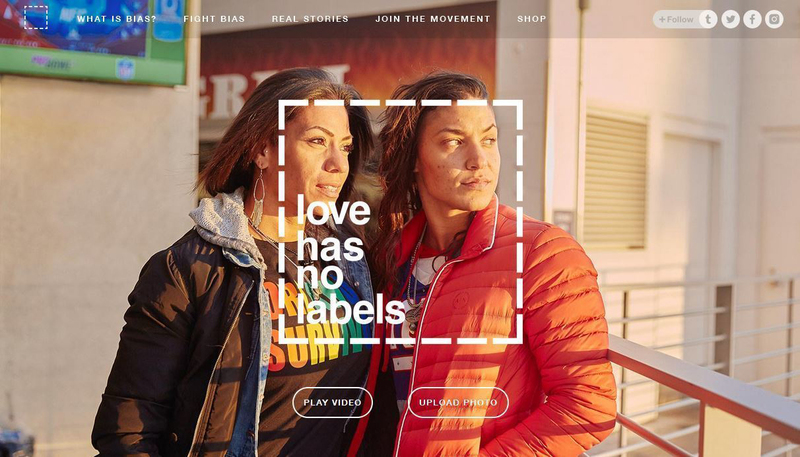 The Love Has No Labels campaign targets all Americans and aims to combat bias, by flooding culture with messages that are inherently non-bias. They aim to normalize all types of love and relationships simply by integrating these types of love into the content they produce. Our message of love quickly spread through culture, starting a conversation about bias, and what love looks like in America. So much so, that we are rolling out Love Cam partnerships with every major sports league in America (NFL, NBA, NHL, MLS) to transform their Kiss Cams into Love Cams. Meaning, we didn’t just insert our message into culture, we changed culture. By partnering with the NFL (known for having more traditional and conservative fans), we were able to appeal to both right and left winged media and viewers: with our message of love being a featured story by the likes of Fox TV and Breitbart News Network, all the way to the New York Times, USA Today, Huffington Post and even Ellen DeGeneres. The fully integrated campaign also included support and activations from key partners including NFL, social platforms and publishers. In addition to debuting the “Fans of Love” cam at the Pro Bowl, NFL will used its platforms including donating time on NFL Network, as well as other fan-facing vehicles, to support the campaign. Upworthy, a 2015 campaign launch partner, continued its support for Love Has No Labels by featuring “Fans of Love” on its social channels. Tumblr supported “Fans of Love” by sharing the video with their Post It Forward community to amplify the campaign’s call to action to the user base at large, as well as hosting an Issue/Answer time in the upcoming months. Facebook, Kargo, ESPN, VOX, Bauer and Little Things extended the campaign message through donated media support on its respective platforms. Hearst shared “Fans of Love” through Seventeen’s and Cosmo’s social channels, and SheKnows and Fatherly are supporting through its respective social channels as well. Publicis Media conducted donated media outreach on behalf of the campaign. Jack Morton Worldwide, a global brand experience agency, has joined the campaign to help extend the “Love Has No Labels” message through social activations on the campaign’s social communities. The Fans of Love Love Cam campaign was developed at R/GA by chief creative officer Nick Law, executive creative directors Chris Northam and Eric Jannon, creative directors Chris Joakim and Mike Donaghey, creatives Alberto Portas and Alfredo Adan, content producer Ashlye Vaughan, executive producers Jeff Skutnik, Kat Friis, and Cindy Pound, chief marketing officer Daniel Dies, business director Stephen Bernstein, business affairs coordinator Melissa Naimi, strategy director Dave Surgan, strategist Amy McEwan, group strategy director Dylan Viner, group account director Shawn Zupp. Filming was shot by director Floyd Russ via Tool of North America with director of photography Gregory Wilson, line producer Elyciphus Siler, executive producers Sarah Di Leo and Nancy Hacohen. Editor was Robert Ryang at Cut + Run with edit assistant Dan Gutterman, executive producer Lauren Hertzberg and producer Ivannah Flores. Visual effects were produced at The Mill, New York, by colourist Damien Van Der Cruyssen, colour producer Natalie Westerfield, executive producer Dee Allen, colour coordinator Elizabeth Angle, colour assist team Nate Seymour, Zack Wilpon and Daniel Moisoff, VFX artists Joseph Grosso and Matt Dolven, producers Ivannah Flores and Wendy Gardner. Sound and music were produced at Nylon Studios by executive producer Christina Carlo, sound mixer Rob Ballingall and producer Halle Petro.